I’d like you to meet the newest member of the Oasis de Esperanza staff, our English teacher Nate Dalke. 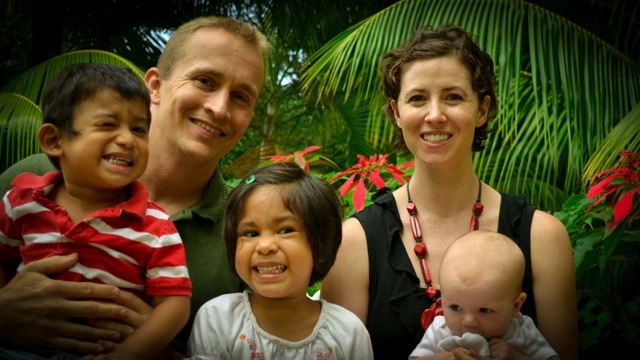 Nate and his wife, Amy, have been in Nicaragua almost as long as Elaine and me. They came to Nicaragua as Young Life missionaries and served in that capacity until about a year ago. Most of his Young Life work was with the students at the American Nicaraguan School, the most elite private school in Nicaragua. Nate left Young Life but didn’t necessarily want to leave Nicaragua. Added to that, they had adopted a little girl, Alicia, and were in the process of adopting her brother, Gabriel. Also added to that Amy was expecting and they now have little Joash in the family. We’ve known Nate since he moved to Nicaragua and have known Amy’s family for many years. Nate did great work with Young Life but felt his season was over. He still wanted to be involved in ministry-related activities and still wanted to be involved with young people. After a couple of visits we discussed his teaching English to our students at Oasis de Esperanza through the end of the 2012 school year. We both decided to try it and see if it was what God wanted. Nate only worked the last month of the school year but it seemed to be a good fit. He seemed comfortable with the kids and they seemed to like him as well. Nate began the 2013 school year as the school’s English teacher and so far it’s a good fit, both sides seem to learn from one another. The irony of this is that the American Nicaraguan School is where Nicaragua’s wealthiest families send their children as well as diplomats and business people from other countries, it’s literally a United Nations of students. The school lacks for nothing, most kids are picked up by drivers and not parents, and a large percentage are accepted into U.S. universities such as Notre Dame and Tulane. In coming to Oasis de Esperanza Nate went to the other end of the economic spectrum! Our students are among the poorest of the poor and at one time felt graduating from 6th grade was a great achievement, college was unheard of but now they are learning basic English and with God and Nate’s help will someday be conversational. We don’t know how long God has for Nate at Oasis de Esperanza but we’re blessed to have him for this season. He’s a blessing to his students and I think the feeling is mutual.